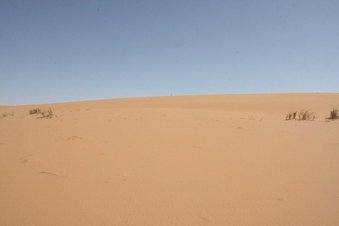 21-Sep-2015 -- In the Namib Desert in Namibia, the intersection of 25 degrees South and 15 degrees East can be found. This point falls within the Namib Naukluft National Park (Dorob NP) and access can only be gained by making use of a concession holder, or in the unlikely event that the Namibian Authorities will issue a permit for you to enter the area unguided. Uri Adventures is one of the concession holders and under their expert guidance, we visited 25S 15E on 21 September 2015 at around 15:15. The confluence is in the desert and vegetation is sparse, as can be seen in the photos. The area is mostly sand. We entered the desert from Lüderitz in the south, and exited at Walvisbay. In the Namib-Naukluft National Park.